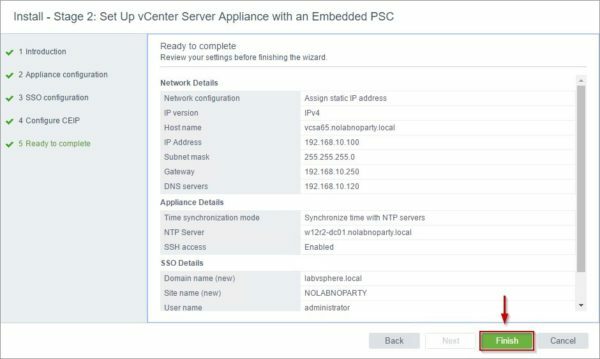 After completing the installation of the VMware VCSA 6.5, stage 2 of the deployment process requires the configuration of some parameters like NTP and SSO settings. The configuration can be done via installer or via web interface. 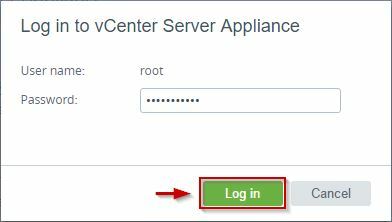 Open your favorite browser and type the address https://IPAddress_DNS_VCSA:5480 and select Set up vCenter Server Appliance option. Enter the root Password and click Log in. Click Next to begin the configuration. 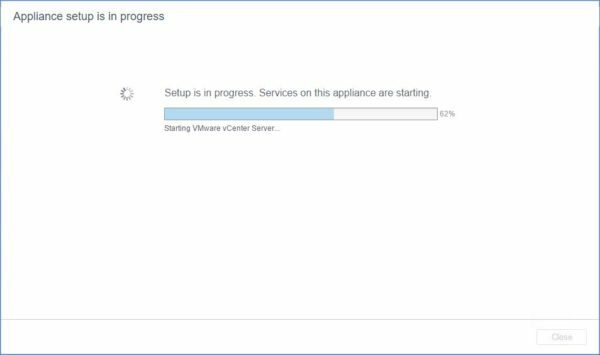 Network configuration reflects the parameters entered during the VCSA installation process. 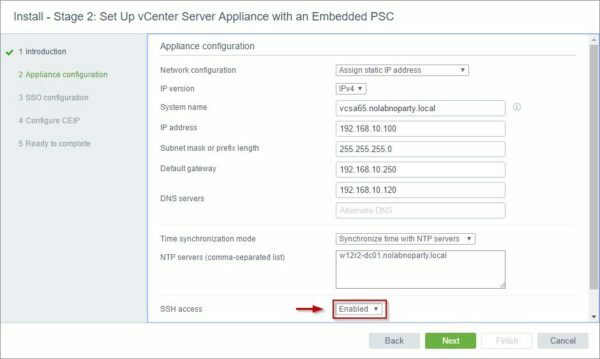 Specify the NTP servers for time synchronization and set SSH access field as Enabled. Click Next. Specify the SSO domain name, SSO password and Site name then click Next. Optionally you can join the CEIP enabling the option. Click Next to continue. Click Finish to complete the configuration and exiting the wizard. 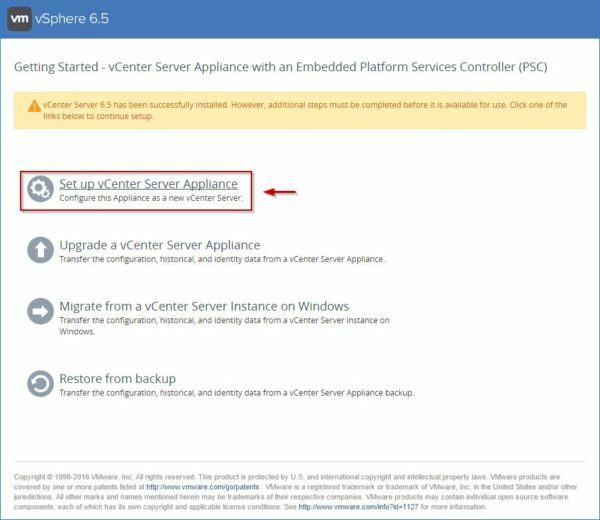 Click OK to confirm configuration installation. The appliance setup is being executed. When the installation completes successfully, click Close to exit the installation wizard. 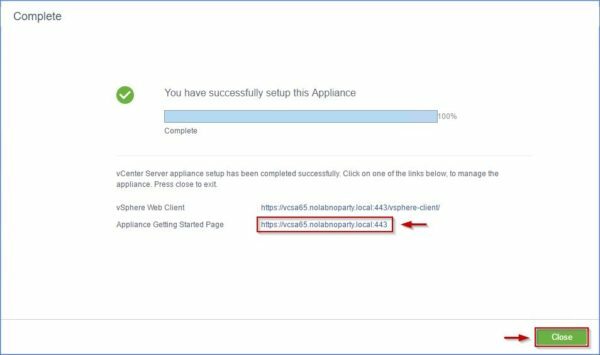 Enter the address https://IPAddress_DNS_VCSA:443 to access the Appliance Getting Started Page. In your browser type the address https://IPAddress_DNS_VCSA:443, enter the root password and click Login. 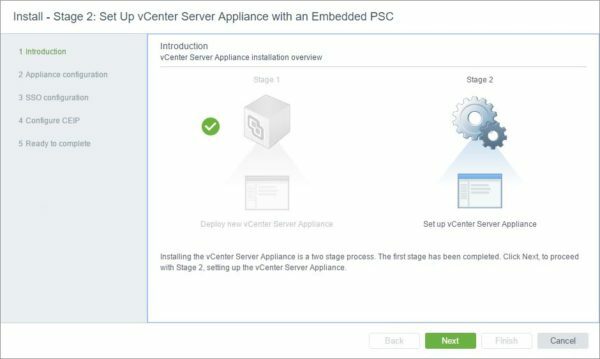 The Appliance Getting Started Page is displayed. 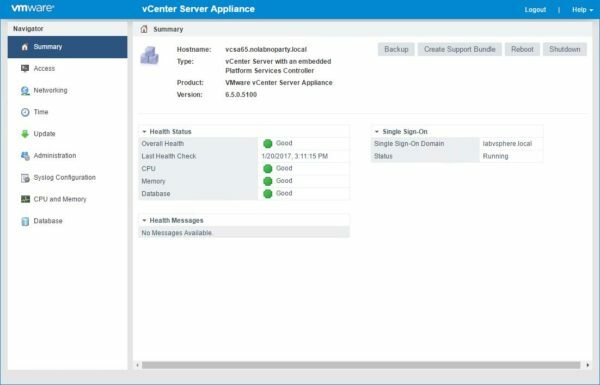 Here you can set the VCSA's settings. 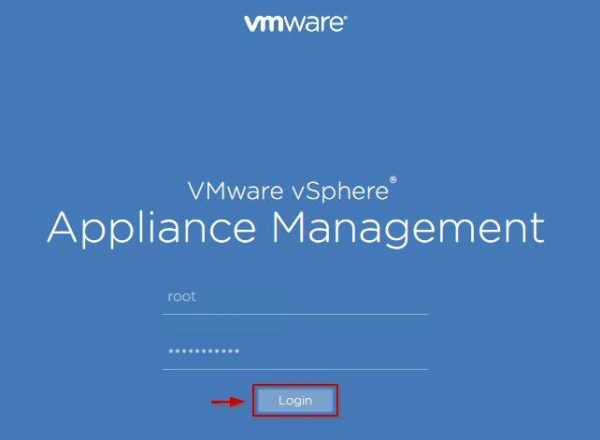 In your browser type the address https://IPAddress_DNS_VCSA:443/vsphere-client, enter the User name and Password and click Login. 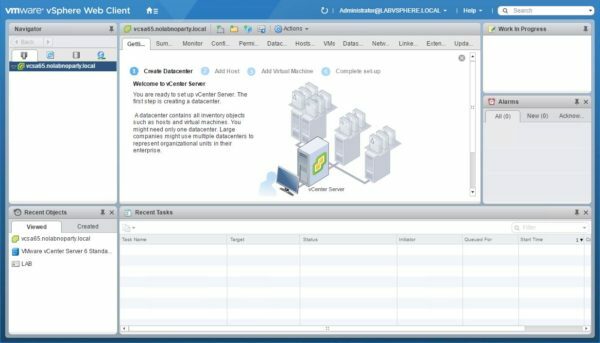 This is the classic Flash-based vSphere Web Client that offers all the functionalities of the new vSphere 6.5 version. 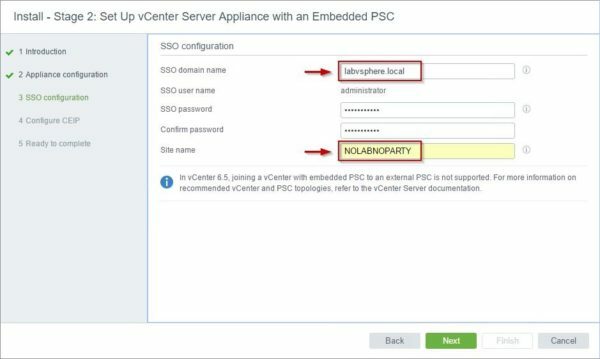 Typing the address https://IPAddress_DNS_VCSA:443/ui instead, you can access the new HTML5-based vSphere Web Client but currently has a limited functionality. 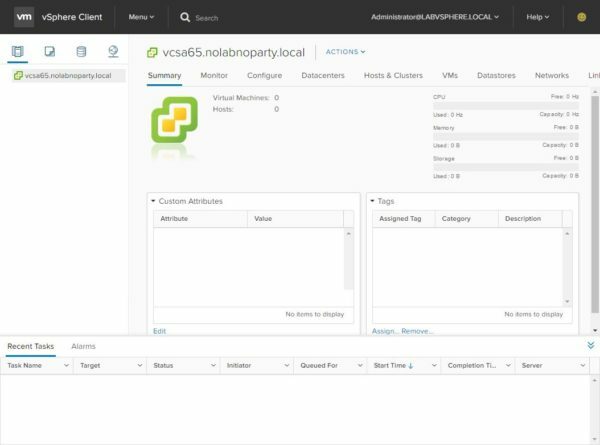 In version 6.5 the vSphere thick client is no longer available.